Himeji is internationally famous for its stunning castle. The private Sanyo Dentetsu railway network connects Himeji station to the coastal areas, and acting as a bridge between Kobe and Himeji, offers many coastal lines. Most of the stations are within walking distance of the beach. Himeji Port, which is located in the southern part of the central area (Take a bus from the JR Himeji Station), has various ferries to the east end islands in the Seto Inland Sea, to Ieshima that floats on the Harima open sea and to Shodoshima, a very popular tourist spot. Therefore, you can say that this area is a main gate to all the sightseeing spots in the Seto Inland Sea to the guests who are staying around Osaka and Kyoto. The southeast part of Himeji has the only natural coastline in this area, beaches, a cliff, hiking course, yacht harbour, camping spots, golf courses and there is an impressive festival, Kenka Matsuri, in the fall season. This is a convenient spot that takes you to the beach with beautiful water with reasonable fare from the Kansai area. This is the second largest island in the Seto Inland Sea. 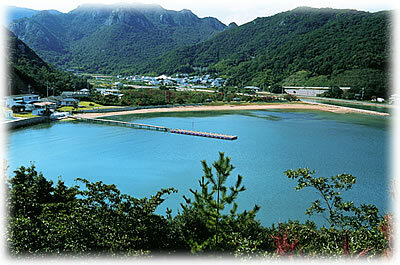 You can enjoy onsen (hot spring), hiking and kayaking as well as swimming in the ocean. From JR Himeji station: change to Sanyo Dentetsu Railway ; the station is across the street from the central exit of the JR station. Take a local train to Osaka, get off at Yaka (15min). From there it's a 15-minute walk South along the river to Kiba Yacht Harbour . Most of the coast area between Osaka and Himeji has been reclaimed as an industrial area. Even though it lacks natural beaches, there are a lot of recreational spots around the city where families can enjoy their weekends - it's getting more and more popular. They always have a fall festival in the areas along the Sanyo Dentetsu lines. Fall is the best season for entertainment. In particular the 'Nada festival' ,which is held on October 14 and 15, has gorgeous portable floats and also spectacular fights between portable shrines that are bumped into each other. 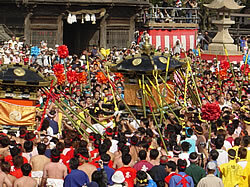 This festival is based on the local sea culture and it's also one of the big entertainments next to the Himeji castle. About 200,000 people visit every year and this 2-day long festival has a very unique culture, so it enjoys a great reputation with foreign visitors too. The festival takes place around Shirahama no miya station on the Sanyo Dentetsu Railway, one stop before Yaka station. The red wall coast adjacent to the yacht harbour: this is a coast where steep and strangely shaped rocks located from altitude 50m to 60m run for about 900m. As it resembles the "Red wall" of the Yangtze River, in China, it is named "Small red wall". It's selected as one of the 100 beautiful sights in the Seto Inland Sea Area. There's also a hiking course and the observatory on the top has a great view of Harima open sea. When the cherry blossom season comes in mid April, this area becomes a great spot to enjoy watching the flowers. Recently we often see a lot of rock-climbers. An old tomb still remains here, which visitors are able to enter. If you follow the path over the top of the cliff further to the east, there is a beach and camping site, called Fukudomari Marine Belt , so you can visit these places while you are hiking from the harbour. There are a lot of business hotels in Himeji City. Food: There aren't many restaurants around the Kiba area, so prepare a picnic! 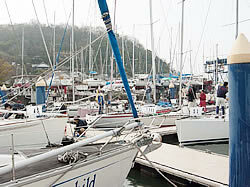 Kiba Yacht Harbour: here, you can receive information about the Kiba Area, and also about sailing in the Seto Inland Sea in general. Ieshima Islands are located in the east of the Seto Inland Sea and also in the center of the Harima Open Sea, consisting of 40 islands of different sizes. Fishing, the shipping industry, quarrying and the ship building industry are the main industries. 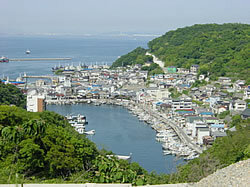 The main island Ieshima has a large population and a lot of houses surround the port. Even though it's an isolated island, Ieshima has a great port and enjoys easy access to the city, so it's been prospering with lively atmosphere in many fields. You can enjoy your day experiencing the island's lifestyle and various history and culture by looking at the streets running up a steep slope coming from the lively port or walking around narrow alleys or steps. 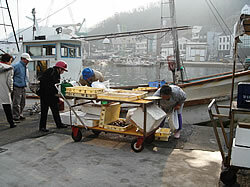 Since the fishery is flourishing here, it would be also fun looking for some fresh seafood. The island of Tanga-jima has greatly changed shape due to the quarrying. It would be very interesting to see the situation from both the environmental and industrial aspects. Also this island has facilities for fishing and summer activities. There are some minshuku on Tanga-jima and you can enjoy swimming, fresh and delicious seafood dishes there. Also, you can experience fishery (reservation required) and you can take in various experiences such as drawing a fishing net from a boat or going and see the offshore fixed net. From Himeji: Take the bus to Himeji Port as described for Ieshima. Take the Shikoku Ferry to Fukuda Port on Shodoshima. Shodoshima, which is the second largest island in the Seto Inland Sea has a rias coastline, so a lot of deeply indented parts of the southern coast offer beautiful curves. Its shape looks like a puppy facing towards west. Also there are small islands here and there around the island. Shodoshima has 7 ports and these are connected to Kansai (Osaka, Kobe, Himeji) and Shikoku (Takamatsu). As you can imagine from the number of sea-lanes, Shodoshima is a very attractive spot and many tourists visit there every year. In the summer time, all the beaches are full of people, creating a great fun atmosphere. Most of the main roads of the island are facing the coastline, so you can enjoy the great view of the ocean wherever you are driving. When you get off a ship, the first thing you will probably notice is the 'smell'. The smell of the ocean is also one of the great features of being on an island. Also, you will see a lot of olive trees here and there. It was 1908 when the olive trees were brought on the island for the first time. 3 prefectures were selected to experiment cultivating olive oil and they started out the trial plantation with a scale of 1.2 hectares of land. The trees planted on Shodoshima were the only ones growing relatively well and it's said that 507 trees took root out of the 519 trees planted. The success of the olive plantation on Shodoshima must come from the farmers' steady effort and the island's mild climate which reminds us of the wind from the Mediterranean sea. Hiking: Take a bus from Kusakabe Port to Kouuntei . The nearby Kankakei gorge is one of the must-see spots. On sunny days, if you take the ropeway up to the top of the mountain, you can see clearly the ships going through the Seto Inland Sea, Shikoku mountain range and Naruto bridge in the distance. There are some hiking courses too. After getting off the ship at Fukuda Port, you can also circle the Island to the North. You will find Seatiger Island Inn (Hotel/restaurant) in the Yoshida area (about 5 min by bus, 20 min on foot). They have a private pier and they also run a restaurant there. There are camp sites and Onsen around there, so you can enjoy walking along the coast, nice dinner, the great view of the Seto Inland Sea from the Yoshida Dam Viewing Platform and visiting Yoshida Onsen. If you have enough time to explore, you should try walking around on the mountain paths called Henro-michi (pilgrim's path, ) starting from Yoshida Dam. After that, you should visit the Quarry Park (michinoeki zanseki kinen koen, ). This is the quarry were stones were taken from to built Osaka castle and you can also learn about the way of carrying the stones in those days. Kayak: Shodoshima is an ideal base for sea-kayak. Sea links for kayak operators. Rental cycles, cheap accommodation. Located conveniently close to Sakate Port, were boats from Osaka-Kobe arrive. not only accommodation, but also cycle rental. Seatiger Island Inn: you can enjoy local seafood, barbecue on the terrace or stay in cottage-type rooms.